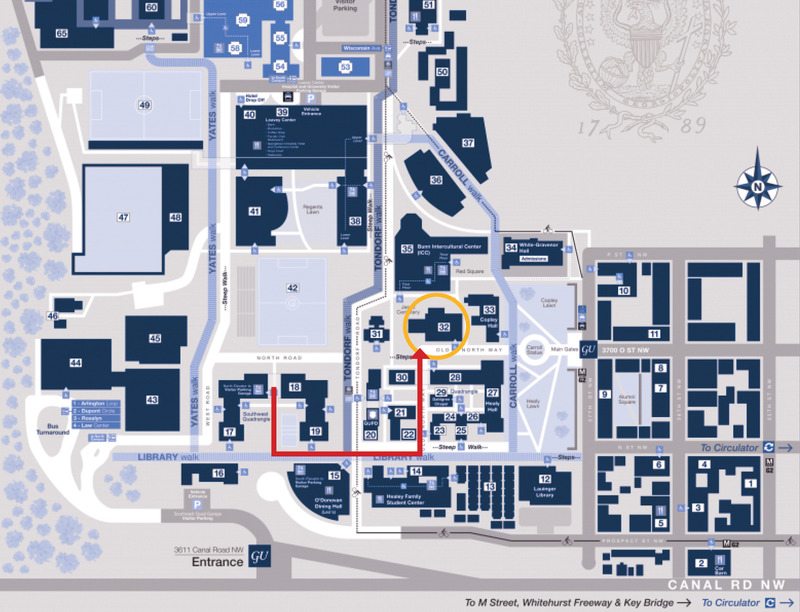 We strongly recommend using a taxi or ride service and being dropped off and picked up at the Front Gates at 37th Street and O Street NW, using the address “3702 O Street NW.” This is the main entrance to Georgetown’s campus and taxis are often available there. It is a short walk (approximately one block) to the Davis Performing Arts Center/Gonda Theatre. Walk through the circle toward the castle-like buildings. Walk between those two buildings and the Davis Performing Arts Center will be right in front of you (with the large marquees). If you are driving to campus, please allow approximately 20 minutes to park and walk to the Davis Performing Arts Center. Limited parking may be found on the Georgetown campus in the cash-only parking garage located in the Southwest Garage (SWQ) off the entrance to campus only accessible from Canal Road. Search for “Southwest Garage, Washington, DC 20007” when mapping directions. Parking is free on weekends. On weekdays, parking is $9 after 7:00 PM. For more details, visit https://performingarts.georgetown.edu/plan-your-visit/parking. There is limited street parking in the neighborhood (metered and unmetered) that is good for two hours until either 8:30 PM or 9:00 PM, depending on location and subject to parking signs/meters as applicable. Take Metro rail to Dupont Circle and transfer (stop is at P Street and 20th Street) to the G2 bus to Georgetown University. It lets you off at the Front Gates. Check schedule/route at wmata.com. Follow the road, through the tunnel, around to the right. The Davis Performing Arts Center will be on your left. (Building highlighted in yellow on the map).